The Central Programmer allows you to control your Electrorad Digi-Line electric radiators, setting a detailed heating schedule that's both convenient and energy-efficient. Communicating via radio frequency, the Central Programmer takes command of the receivers already present in Digi-Line products - allowing completely wireless control of your heating from one central location. The Electrorad Digi-Line Central Programmer can be fitted either freestanding or wall mounted: a straightforward DIY task . The programmer should be mounted in a dry location; it is not drip-proof or splash-proof and should never be installed in a bathroom. This item is available with free next working day delivery. Next working day delivery is available when you order before 11am (excluding weekends). The Electrorad Digi-Line Central Programmer allows you to easily programme all your radiators from any location in the house. 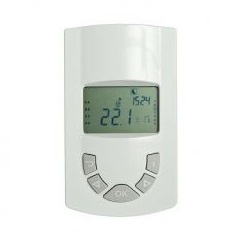 The central programmer gives you control over the temperature and timing of your electric heating. You can use the programmer to set separate heating schedules for up to 4 zones, with a choice of 4 built-in heating programmes and 4 user-configurable programmes. Each programme can be adjusted in steps of only half an hour, giving you precision control over your heating, maximising your energy savings. Comfort timer and holiday mode functions give you the added scope to maintain your comfort whilst continuing to ensure maximum savings for minimum effort. The programmer uses a radio frequency to communicate with the receivers already built into your Digi-Line electric radiators, so no wiring is required. The programmer is battery powered and can be installed freestanding or mounted on the wall – an easy DIY job. All programmes are saved in an EEPROM non-volatile computer memory so they will not be lost in the event of an ordinary power cut. The programmer has a lockable keypad and comes with a 1 year warranty. For more information, check the Digi-Line manual and programming instructions .